Married Name before 1924 As of before 1924,her married name was Meyer. Clara Hasz was born on 18 January 1902 at Wisconsin. Clara Hasz married Herbert A. Meyer before 1924. Clara Hasz died on 16 August 1929 at age 27. [S244] U.S. Federal Census 1910 U.S. Federal Census, by Ancestry.com, Dwelling 107. ED 130. Married Name circa 1923 As of circa 1923,her married name was Ohland. Bertha Hasz was born on 25 January 1904 at Wisconsin. Bertha Hasz married Albert Ohland, son of Henry J. Ohland and Dorathea (? ), circa 1923. Bertha Hasz died in October 1995 at age 91. Bertha Hasz obtained US Social Security Card at Wisconsin; last residence Reedsburg, Sauk, Wisconsin. Name Variation Elsa M. Hasz was also known as Elsie. Married Name 22 October 1924 As of 22 October 1924,her married name was Meyer. Elsa M. Hasz was born on 7 May 1906 at Wisconsin. 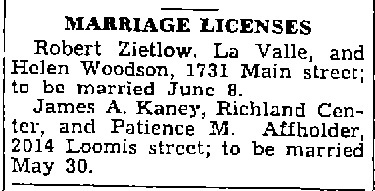 Elsa M. Hasz married Paul Meyer on 22 October 1924. 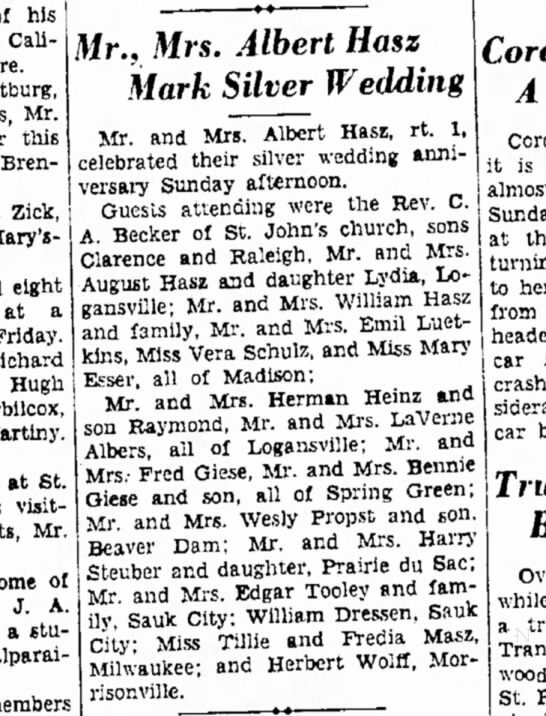 Elsa M. Hasz and Paul Meyer were divorced before 1940. Elsa M. Hasz died on 6 September 1995 at age 89. Emma Hasz was born circa July 1908 at Wisconsin. Married Name May 1909 As of May 1909,her married name was Hasz. Emilie Johanna Thieding was born in 1890 at Wisconsin. She was the daughter of (?) Thieding. Emilie Johanna Thieding married August W. Hasz, son of Henry William Hasz and Amelia Johanna Giese, in May 1909. Emilie Johanna Thieding died in 1978. 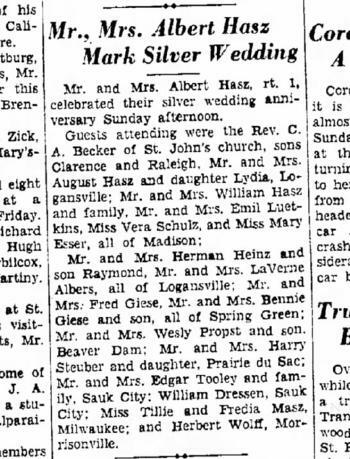 On 5 November 1939 at Mr and Mrs Albert Hasz 25th wedding anniversary. [S181] Wisconsin, Sauk Co Cemetery Records Vol 2, pg 67. [S244] U.S. Federal Census 1910 U.S. Federal Census, by Ancestry.com, Sheet 7A. Stamp 67. Dwelling 144. ED 130. Married Name 5 November 1914 As of 5 November 1914,her married name was Hasz. Emma L. Steuber was born in 1893 at Wisconsin. Emma L. Steuber died in 1980. [S181] Wisconsin, Sauk Co Cemetery Records Vol 2, pg 68. [S243] U.S. Federal Census 1920 U.S. Federal Census, by Ancestry.com, ED171. Dwelling 69. Stamp 132. John Grover was born in 1652 at Hurstpierpoint, Sussex, England. He was the son of James Grover and Rebecca Grover. 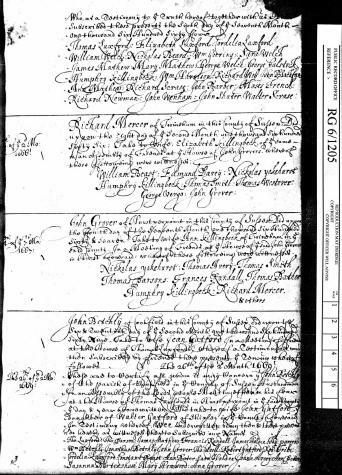 John Grover married Ann Killingbeck, daughter of Edward Killingbeck, on 4 July 1667 at at John Grover Sr.'s house, Hurstpierpoint, Sussex, England, also reported as 1665; Reference ID: p. 3, entry 2. 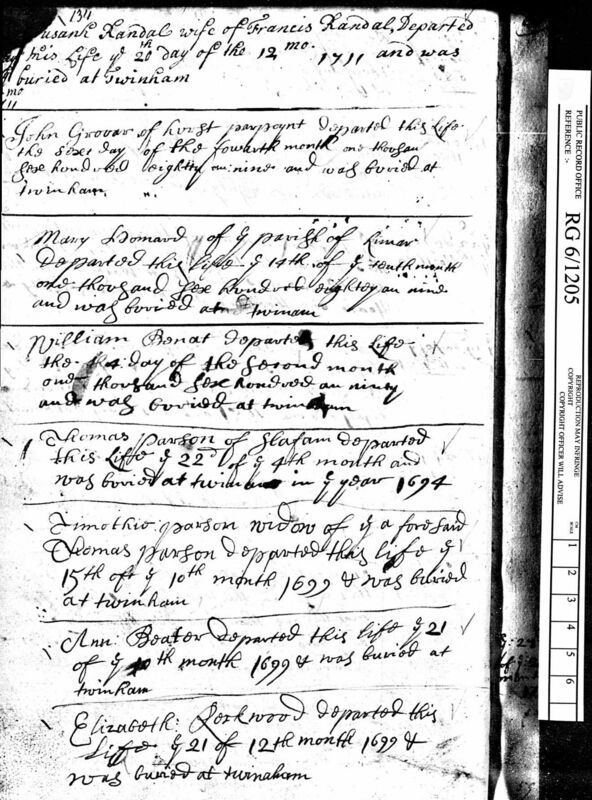 John Grover died on 6 April 1689 at Sussex, England. He was buried after 6 April 1689 at Friends Burying Ground, Twineham, Sussex, England. Name Variation Ann Killingbeck was also known as Anne. Married Name 4 July 1667 As of 4 July 1667,her married name was Grover. Ann Killingbeck was christened on 27 December 1638 at Twineham, Sussex, England; Father: Edward Killingbeck. She was born on 27 December 1638 at Twineham, Sussex, England. She was the daughter of Edward Killingbeck. Ann Killingbeck married John Grover, son of James Grover and Rebecca Grover, on 4 July 1667 at at John Grover Sr.'s house, Hurstpierpoint, Sussex, England, also reported as 1665; Reference ID: p. 3, entry 2. Ann Killingbeck died on 11 April 1672 at Twinham, Sussex, England, at age 33 also reported as 11 Jun 1672. She was buried after 11 April 1672 at Twineham, Sussex, England. 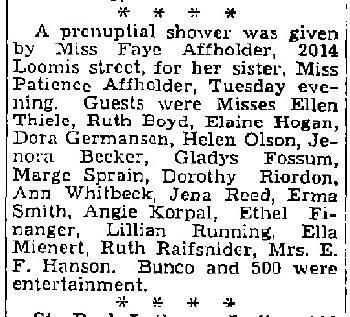 Married Name 1699 As of 1699,her married name was Fincher. Martha Taylor was born on 3 January 1680 at Little Leigh, Cheshire, England, also reported as 06 Dec 1680 and 3 Jan 1681. She was the daughter of Robert Taylor and Mary Hayes. 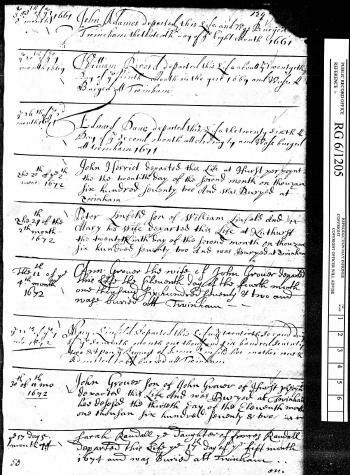 Martha Taylor married John Fincher, son of Francis Fincher and Mary Achelly, in 1699. Martha Taylor died in 1713 at London Grove, Chester, Pennsylvania. 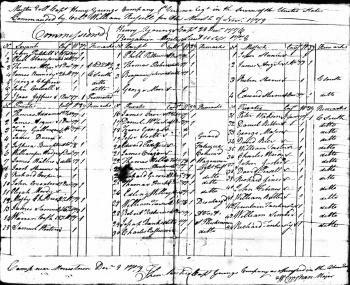 Martha Taylor immigrated with Mary Hayes on 29 September 1683 at ship "Endeavor" from England to, Pennsylvania; Robert Taylor had arrived a year earlier. 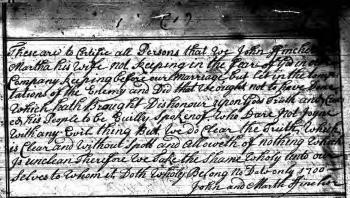 In 1700 at Quaker Chester Monthly Meeting, Chester, Pennsylvania, admitted to fornication before marriage (though married at the time of this acknowledgement). Name Variation Samuel Wooten was also known as Wootten. 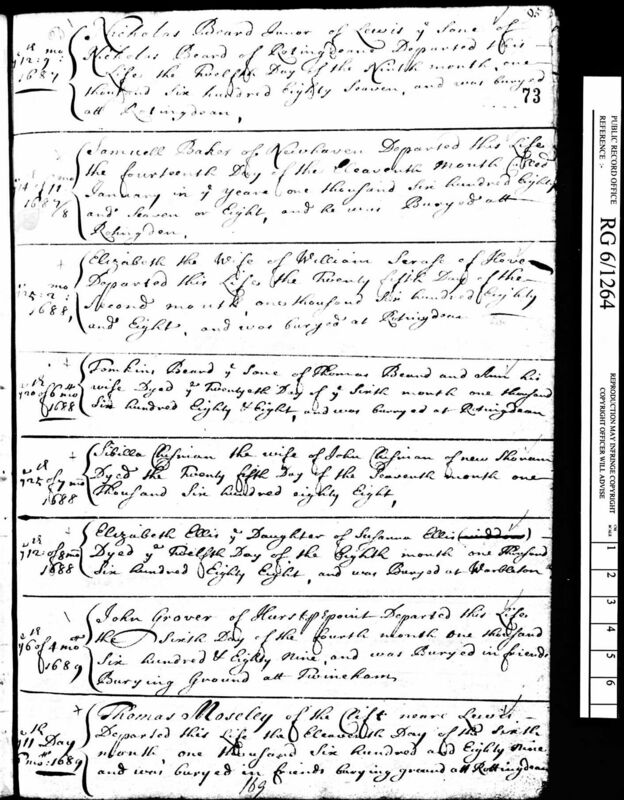 Samuel Wooten was born on 11 January 1726 at Mecklenburg, Virginia, also reported as 1725. He married Sarah Elizabeth Callaway, daughter of John Callaway and Sarah Windsor, in 1748. Samuel Wooten died in 1814 at Mecklenberg, Virginia. He was buried in 1814 at Mecklenberg, Virginia. 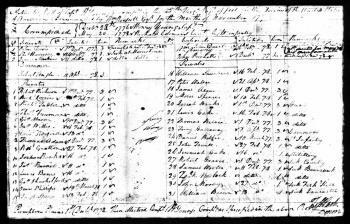 1782 Continental Census, Mecklenburg, Virginia Samuel Wooten appeared on the census of 1782 at Continental Census, Mecklenburg, Virginia. 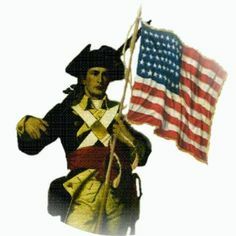 1790 First Census of the United States, Mecklenburg, Pennsylvania He appeared on the census of 1790 at First Census of the United States, Mecklenburg, Pennsylvania, may have been 1782. Item, I lend to my beloved Wife Sarah Wooton all my Estate both real and Personal during her widowhood, and should she marry I lend to her One Third of all my Estate both Real and Personal during her life. Item, I give to my Son Samuel Wooten all my land and still and one fifth part of all my estate to him and his heirs forever. My will and desire is that my Son Samuel Wootton may live on the land and work his hands on the land and overlook for his mother during her life. Item, I lend to my son John Wootton (wife) one of her children pates (sic) of my Estate during her life and at her death to be equally divided amongst all her children. Item, I give to my son John Wootton children one fifth part including the part that I lend to their Mother Mary Wooton to them and their Heirs forever. Item, I give to my daughter Ann Shelton children one fifth part of all my Estate to them and their heir forever. Item, I lend to my Daughter Martha Tanner one fifth part of all my Estate during her life, and at her death to be equally divided amongst all her children to them and their heirs forever. Item, I give to my Daughter Sally Daniel children one fifth part of all my Estate to them and their Heirs forever. My will and desire is if my Estate cannot be divided amongst my Daughter Children for my Executor to sell the contents and divide the money . . . amongst my Daughters children. /s/ Samuel Wooton Sr, “X” his mark. At a Court held for Mechlenburg County the 20th day of March 1815 -- This Will was presented in Court and the same was proved by the oaths of Peter Bailey, Otway Bailey and John P. Wootton the three subscribing witnesses and ordered to be Recorded. And at another Court held for said County on the 16th day of March 1816. Samuel Wootton the executor named in the last will and testament of. Samuel Wootton Senr and personally appeared in Court and refused to take upon himself the ____ ____ and ________ thereof. On the Motion of Peter Bailey who made oath and together with Joseph _ Clausel Samuel Wootton and George W. Brame his securitors entered into and acknowledge a bond in the penally of twenty thousand dollars ____ as the Law directs. Certificate is granted the said Peter Bailey for obtaining letter of administrative with the sale ann-- on the Estate of Chesaw Samuel Wootton desc. in due form. Name Variation Sarah Elizabeth Callaway was also known as Elizabeth Sarah. Married Name 1748 As of 1748,her married name was Wooten. Sarah Elizabeth Callaway was born in 1730 at Mecklenberg, Virginia. She was the daughter of John Callaway and Sarah Windsor. Sarah Elizabeth Callaway married Samuel Wooten in 1748. Sarah Elizabeth Callaway died in 1761. Name Variation Sallie Elizabeth Wooten was also known as Elizabeth Sallie. Name Variation Sallie Elizabeth Wooten was also known as Sally. Married Name 9 January 1806 As of 9 January 1806,her married name was Daniel. Sallie Elizabeth Wooten was born in 1758 at Mecklenberg, Virginia. Sallie Elizabeth Wooten married William Powell Daniel on 9 January 1806 at Mecklenburg, Virginia. Sallie Elizabeth Wooten died in April 1851 at Coffee, Tennessee. Name Variation Ann Wooten was also known as Wootten. Married Name 1771 As of 1771,her married name was Skelton. Ann Wooten was born in 1754 at Mecklenberg, Virginia. 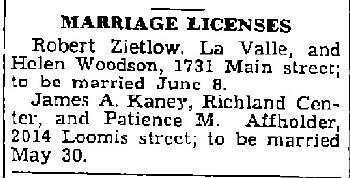 Ann Wooten married Mark Skelton, son of John Skelton and Elizabeth (? ), in 1771 at Mecklenburg, Virginia. Ann Wooten died before 1814. 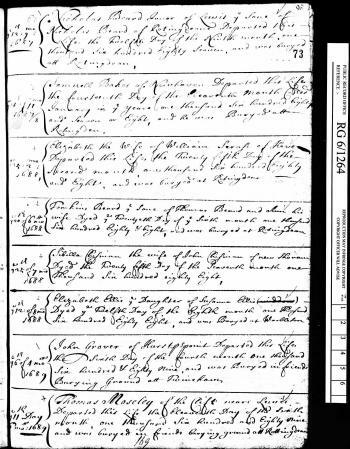 John Wooten was born in 1752 at Mecklenberg, Virginia. He was the son of Samuel Wooten and Sarah Elizabeth Callaway. John Wooten married Mary Christopher on 18 March 1785. John Wooten died before 1814. Samuel Wooten was born in 1750 at Mecklenberg, Virginia. Name Variation William B. Richards was also known as W. B.
William B. Richards was born in January 1834 at England. William B. Richards died after April 1910. William B. Richards immigrated in 1847. [S6] Wisconsin, Wisconsin Vital Record to 1907. [S248] U.S. Federal Census 1860 U.S. Federal Census, by Ancestry.com, Page 63. Written number 663. Dwelling 504. Name Variation Mary Jane Tyack was also known as Mary Elizabeth De Vore. Married Name 7 January 1856 As of 7 January 1856,her married name was Richards. Mary Jane Tyack was born circa August 1839 at England. She was the daughter of William Tyack. Mary Jane Tyack died on 22 March 1884. She was buried after 22 March 1884 at British Hollow Cemetery, Rockville, Grant, Wisconsin, Inscription: 44y7m - w/o W B Richards; Note: same stone as Tyack. George Glover married Alice Launfall. Married Name Her married name was Glover. Alice Launfall married George Glover. Sarah Vestal was born in 1693 at Chester, Pennsylvania. She was the daughter of William Vestall Sr. and Alice Glover. Sarah Vestal died on 3 March 1696 at Chester, Pennsylvania. Mary Vestal was born in 1694 at Chester, Pennsylvania. George Vestal was born in 1698 at Chester, Pennsylvania. Name Variation Patience Marie Affholder was also known as Pat. Name Variation Patience Marie Affholder was also known as Afholder. Married Name 30 May 1939 As of 30 May 1939,her married name was Kaney. Married Name before February 1960 As of before February 1960,her married name was Dawson. Patience Marie Affholder was born on 28 November 1910 at Akron, Ohio, also reported as 02 Dec 1910. She was the daughter of Joseph Matthew Affholder and Mary Pataska. 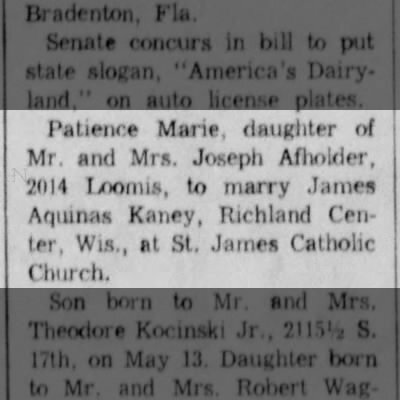 Patience Marie Affholder married James Acquinas Kaney, son of Joseph Michael Kaney and Frances Clara McCarville, on 30 May 1939 at St. James Catholic Church, La Crosse, Wisconsin, 20 Years Ago - 1939 - Patience Marie, daughter of Mr. and Mrs. Joseph Afholder, 2014 Loomis, to marry James Aquinas Kaney, Richland Center, Wis., at St. James Catholic Church. 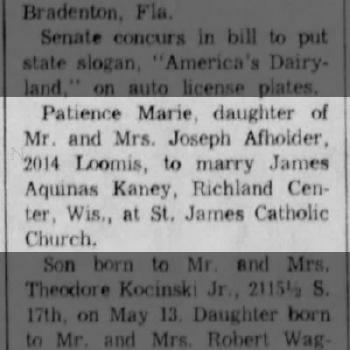 Patience Marie Affholder and James Acquinas Kaney were divorced before 1940 listed as divorced in 1940 census. Patience Marie Affholder married Joseph Dawson before February 1960. Patience Marie Affholder died on 19 January 2002 at age 91 Patience M. "Pat" Dawson, 91, a resident of the Onalaska Care Center, died on Saturday, Jan. 19, 2002, at the care center. She was born on Nov. 28,1910, in Akron, Ohio, to Joseph and Mary (Pataska) Affholder. Pat had owned and operated Pat Dawson's Beauty Shop for many years. She was a lifetime member of St. James the Less Catholic Church. She is survived by a son, Mike (Jeanne) Dawson of Davenport, Iowa; a daughter, Clare (Dan) Kirkland of Onalaska; three grandchildren, Holly (Wes) Inglett, Angie (Troy) Talbot and Shelby Dawson; three great-grandchildren, Joey and Kaitlin Inglett and Kelsey Talbot; a sister, Faye Runice; two sisters-in-law, Ann Hegge and Harriet Dawson; and a brother-in-law, Robert Dawson. She was preceded in death by her husband Joseph. A Mass of Christian Burial will be held on Tuesday, Jan. 22, 2002, at 11:30 a.m. at St. Patrick's Catholic Church, Onalaska. The Rev. William J. Matzek will officiate. Burial will be in the Catholic Cemetery. Friends may call at the church on Tuesday from 10:30 a.m. until the time of services. The Schumacher-Kish Funeral Home of La Crosse is in charge of arrangements. Pat's family would like to give special thanks to the Onalaska Care Center for their loving care of Pat for the past five years. (The La Crosse Tribune January 20, 2002). She was buried after 19 January 2002 at Catholic Cemetery of La Crosse, La Crosse, La Crosse, Wisconsin. [S373] U.S. Federal Census 1940 U.S. Federal Census, by Ancestry.com, Year: 1940; Census Place: La Crosse, La Crosse, Wisconsin; Roll: T627_4491; Page: 8A; Enumeration District: 32-37. Name Variation Frederich William Hinrichs was also known as Fred W.
Name Variation Frederich William Hinrichs was also known as Fredrich Wilhelm. Name Variation Frederich William Hinrichs was also known as F. W.
Frederich William Hinrichs was born on 27 February 1861 at Hanover, Germany. Frederich William Hinrichs married Dorothea Sophia Katherine Schroeder, daughter of George Schroeder and Dorothea Weise, on 30 October 1884. Frederich William Hinrichs died on 3 April 1931 at Reedsburg, Sauk, Wisconsin, at age 70. Frederich William Hinrichs immigrated in 1866. He immigrated with George Hinrichs and Katherine Dorothea Harms in 1866; in the Autumn. In 1929 FRED HINRICHS, son of George and Dorothea (HARMS) HINRICHS, was born Feb. 27, 1861; married Oct. 30, 1884, Dora SCHROEDER, daughter of George and Dorothea (WEISE) SCHROEDER. This lady was born June 23, 1865. 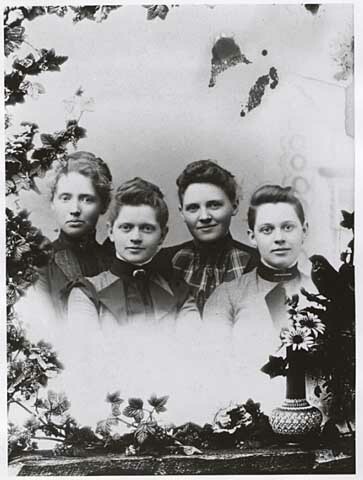 They are the parents of seven children, as follows: Emma, married Herman WSCHRANK; Paul, married Elsie GROETELUECHEN; Elsie, born Oct 4, 1888, married Emil WOLTERS, and died April 18, 1920; Alma (Mrs. Albert HEIDEN, see above); Meta, died in infancy, 1894; Hugo, born March 22, 1897, married Iva WARD; and Emil, born Aug. 5, 1899, now of Denver, Col.
[S250] U.S. Federal Census 1930 U.S. Federal Census, by Ancestry.com, ED56-29. Dwelling 57. Name Variation Dorothea Sophia Katherine Schroeder was also known as Dora. Married Name 30 October 1884 As of 30 October 1884,her married name was Hinrichs. Dorothea Sophia Katherine Schroeder was born on 23 June 1865 at Hanover, Germany. She was the daughter of George Schroeder and Dorothea Weise. Dorothea Sophia Katherine Schroeder married Frederich William Hinrichs, son of George Hinrichs and Katherine Dorothea Harms, on 30 October 1884. Dorothea Sophia Katherine Schroeder died on 3 November 1958 at age 93. 1 June 1905 Reedsburg, Sauk, Wisconsin Dorothea Sophia Katherine Schroeder appeared on the census of 1 June 1905 in the household of Frederich William Hinrichs at Reedsburg, Sauk, Wisconsin. Dorothea Sophia Katherine Schroeder immigrated in 1882. She had 6 with 6 living in 1900 children. She had 7 with 6 living in 1910 children. John Walsh was never married. He was born in December 1847 at Ireland. John Walsh died after January 1920. 1 June 1905 Bear Creek, Sauk, Wisconsin John Walsh was listed as a brother on the census of 1 June 1905 in the household of Michael J. Walsh at Bear Creek, Sauk, Wisconsin. 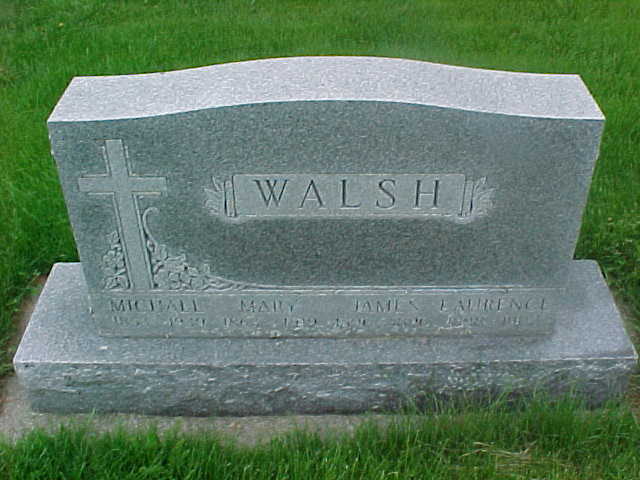 Name Variation Michael J. Walsh was also known as Mike. Name Variation Michael J. Walsh was also known as Welsh. Michael J. Walsh died on 5 May 1939 at Bear Creek, Sauk, Wisconsin, at age 85 Michael J. Walsh, son of Peter and Catharine Walsh, was born near Lake Geneva, Wisconsin, May 10th, 1853, and passed away at the old homestead May 5th, 1939. He attended Holy Hour Thursday evening and went to Mass and Holy Communion Friday morning. During the day he complained of a pain around his heart, but was up and around as usual, until in the afternoon, when he laid down to rest, passing away about 3:30. When six years old he came with his parents to Bear Creek, Sauk county, where he had made his home ever since. He was united in marriage to Mary Kaney, who preceeded him to death twenty years ago. To this union were born six children, Gregory and William, who reside on the home farm, Mrs. Jos. Mousseau of Spring Green and Mrs. Walter Prouty of Loreto; two sons, James and Lawrence, died in infancy. He also leaves fourteen grandchildren and two great-grandchildren, besides a number of nieces and nephews and a host of friends. Mr. Walsh was a devoted member of his church and was always glad to give assistance whenever needed. As a citizen he was held in high respect by all who knew him. 1 June 1905 Bear Creek, Sauk, Wisconsin He appeared on the census of 1 June 1905 at Bear Creek, Sauk, Wisconsin. [S193] Church Record, Zion United Lake Co IN Extract, Thursday May 11, 1939. [S211] Spring Green Weekly Home News, Thursday, May 11, 1939. Peter Walsh was born circa 1857 at Wisconsin. 1 June 1905 Bear Creek, Sauk, Wisconsin Peter Walsh was listed as a brother on the census of 1 June 1905 in the household of Michael J. Walsh at Bear Creek, Sauk, Wisconsin. Name Variation Honora Brigid Gormanly was also known as Leanora. Name Variation Honora Brigid Gormanly was also known as Hanora. Name Variation Honora Brigid Gormanly was also known as Honoria. Name Variation Honora Brigid Gormanly was also known as Anna. Name Variation Honora Brigid Gormanly was also known as Henriette. Married Name 3 July 1857 As of 3 July 1857,her married name was Croal. Honora Brigid Gormanly was born in 1834 at Sligo, Connaught Province, Ireland, also reported as 1835. She married Andrew James Croal, son of John A. Croal and Catherine Clinton, on 3 July 1857 at Whitewater, Walworth, Wisconsin, also reported as Milwaukee, Wisconsin. 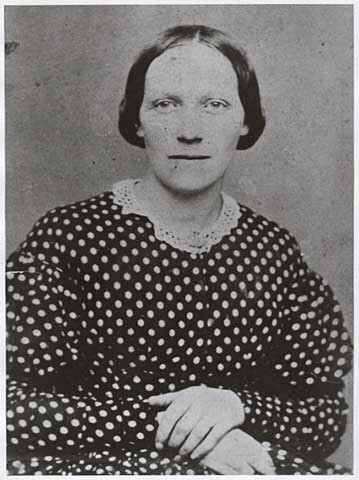 Honora Brigid Gormanly died on 2 January 1881 at Milwaukee, Milwaukee, Wisconsin. [S230] Milwaukee Catholic Cemeteries Cemetery records, by Milwaukee, Block: 6 Row: 256. [S248] U.S. Federal Census 1860 U.S. Federal Census, by Ancestry.com, Dwelling 1719, 1533. Name Variation Catherine L. Croal was also known as Kate L.
Married Name circa 1887 As of circa 1887,her married name was Eastman. Catherine L. Croal was born in 1859 at Wisconsin. Catherine L. Croal married Orienf N. Eastman, son of Daniel T. Eastman and Hannah J. Fowler, circa 1887. Catherine L. Croal lived in 1883 at Andover, Day, South Dakota, made homestead. She purchased land on 25 May 1889 at Day, South Dakota, CROAL KATE 05 123 N 059 W 012 160 251101 PA 3856 05/25/1889. Circa 1890 Mary Anne Croal (later Mrs. L. M. Kaercher), second from right, with her sisters. She lived in 1900 at Andover South Twp, Day, South Dakota. 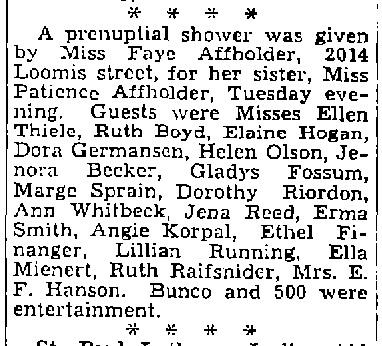 She lived in 1901 at Minneapolis, Minnesota, son Francis not listed in this directory. She lived in 1905 at Ranier Boulevard, Seattle, King, Washington, son also listed in director as Musician at Columbia Station. She had 1 with 1 living in 1910 children. In 1915 Mrs. Kate Eastman, living in Seattle, is the widow of O. N. Eastman, who was traveling auditor for the Empire Elevator Company at the time of his demise.9 She lived in 1918 at Oakland, California. [S329] Minnesota Death Index, 1908-2002 (published), Certificate: 788. 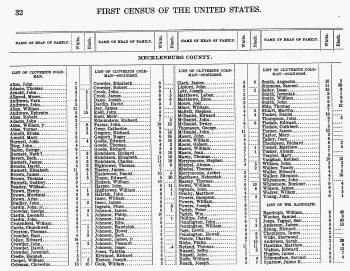 [S244] U.S. Federal Census 1910 U.S. Federal Census, by Ancestry.com, ED331. Dwelling 185. [S243] U.S. Federal Census 1920 U.S. Federal Census, by Ancestry.com, ED110. Dwelling 111. [S250] U.S. Federal Census 1930 U.S. Federal Census, by Ancestry.com, ED17-203. Dwelling 44. [S373] U.S. Federal Census 1940 U.S. Federal Census, by Ancestry.com, Year: 1940; Census Place: Seattle, King, Washington; Roll: m-t0627-04382; Page: 11A; Enumeration District: 40-295.